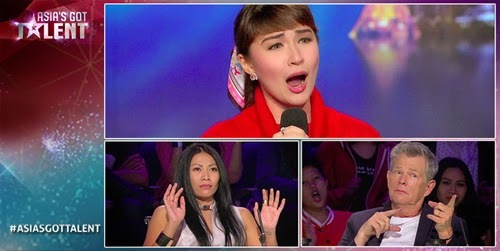 VIDEO: Watch Filipina classical singer Gerphil Geraldine Flores earns Golden Buzzer in ‘Asia’s Got Talent’ - Balita Boss! Filipina classical singer Gerphil Geraldine Flores performed her version of "Speak Softly, Love" from the classic "Godfather" movie on "Asia’s Got Talent" aired on April 9 episode. Asia’s Got Talent judges, David Foster, former Spice Girls member Melanie C, Indonesian superstar Anggun, and Taiwanese actor-pop singer Vaness Wu, as well as the studio audience, gave Flores a standing ovation. Flores will go straight to Asia's Got Talent semi-finals at Marina Bay Sands after earning the Golden Buzzer from Foster. Watch the performance of Gerphil Flores below. We thought he might never do it, but FINALLY…David Foster hits the #GoldenBuzzer! David finds what he was looking for in the angelic singing voice of Gerphil G. Flores - and it was well worth the wait! A Filipino shadow play group, El Gamma Penumbra, also got the golden buzzer on April 2 episode after the judges were amazed by their performance, a dance routine shadow play showing some of the famous tourist destinations around the world. The Velasco brothers and Gwyneth Dorado, also from the Philippines, will be competing in the first round of semifinals next week. "Asia’s Got Talent" semifinals air Thursdays, 8:05 p.m. on AXN. Grand finals are on May 7; grand finals results are on May 14. For voting details, visit http://asiasgottalent.tv/vote/.